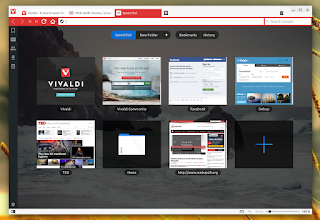 Vivaldi is a new Chromium/Blink based web browser aimed at power users. I won't get into details here, since we already covered Vivaldi a few weeks ago, so check out our previous article for more information. [Quick update] The Vivaldi Dev team announced a new Vivaldi snapshot today and with it, they've decided to provide 32bit Linux binaries (deb and rpm) for download. The official Vivaldi website offers the latest Tech Preview so it doesn't include 32bit Linux downloads. To download the latest Vivaldi snapshot which includes 32bit deb and rpm binaries, visit THIS Vivaldi Blog article. Note that by installing any Vivaldi version (tech preview, snapshot, etc. ), the package automatically adds the Vivaldi stable repository (at least in Ubuntu/Debian) and if you install multiple Vivaldi versions, it may result in duplicate repositories - this can be fixed by deleting the extra vivaldi-*.list repository file from /etc/apt/sources.list.d/. Vivaldi is not stable yet and you'll find missing features and bugs. Report any issues you may encounter HERE.